Eric Decker has clearly enjoyed his time with Peyton Manning and has emerged as one of top receivers on the Denver Broncos and in the NFL. The intelligent wide receiver gives the Broncos three legitimate stars for Manning to throw passes to and still has prime years ahead of him. Eric Decker cards are still on the lower side of the collecting world, but a few big performances could have them surging upward. 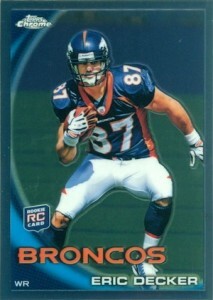 Shop for Eric Decker cards on eBay. Eric Decker was one of the top college receivers as a member of the University of Minnesota. An injury late in his Senior season derailed his progress and resulted in a drop down the draft boards. Unable to participate in the NFL combine or his own pro day, Decker boosted his profile by scoring a 43 on the Wonderlich test. He was selected in the third round, 87th overall, by the Denver Broncos. The Broncos has already selected Demaryius Thomas and Tim Tebow with their first round picks, loading up on young talent. Although Tebow did not pan out like they hoped, the two new wide receivers were both valuable additions. After two solid, but unimpressive seasons for Eric Decker, Peyton Manning came to town and Decker was one of the main beneficiaries. He posted two consecutive years with over 1,000 yards and 10 touchdowns. Even with Wes Welker added to the rotation, Decker has continued to produce, including a 2013 game against the Kansas City Chiefs where he had four touchdowns and 174 yards. As a free agent in 2014, it remains to be seen what will happen, but Eric Decker could be a very popular option for other teams in need of a wide receiver. Outside of football, Eric Decker has also made news with his marriage to singer, Jessie James. 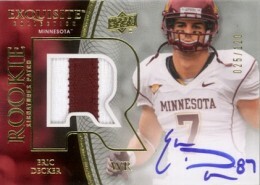 With nearly 30 Eric Decker cards for rookie collectors, there are plenty of options, regardless of budget. There are also four signed college-themed cards from Upper Deck which are very popular with collectors. 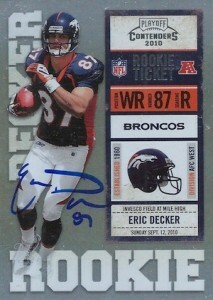 '10 Panini Playoff Contenders Football "ERIC DECKER CHROME AUTO ROOKIE TICKET"